It’s time for the CCTV 2018 New Year’s Gala – follow the highlights and the low points here. 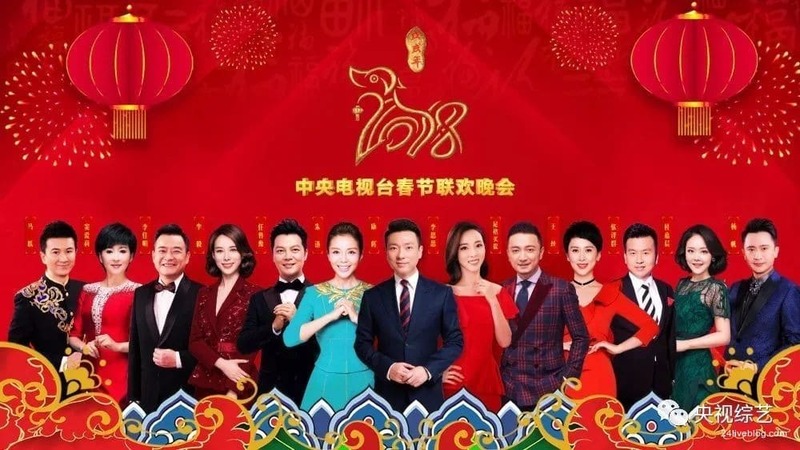 It is time for the CCTV Spring Festival Gala, one of the most-watched, most-discussed, and most mocked lived television events in the world, taking place on the Lunar New Year’s Eve. 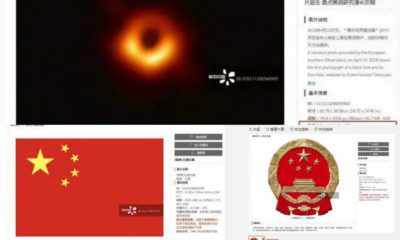 What’s on Weibo discusses the ins & outs of the 2018 edition and the social media frenzy surrounding it in this live blog. 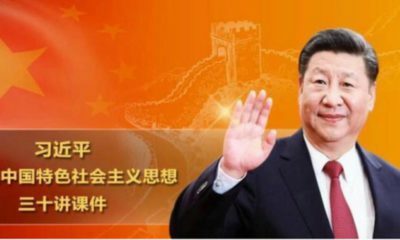 Check out our CCTV Spring Festival Gala 2019 Live Blog here. 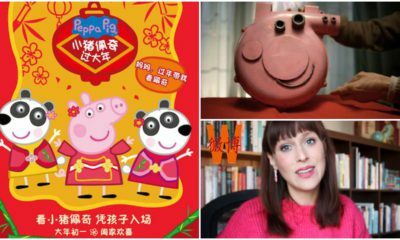 The biggest live televised event in the world, the CCTV New Year’s Gala, also known as the Spring Festival Gala or Chunwan (春晚), is a true social media spectacle. On February 15th 2018, the 36th edition of the 4-hour-long live production is taking place. 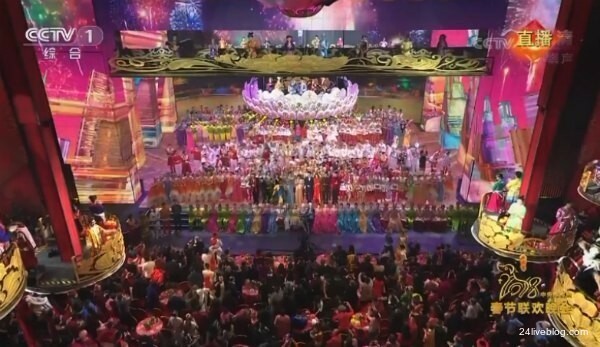 The show, that is organized and produced by the state-run CCTV since 1983, is not just a way for millions of viewers to celebrate the Lunar New Year (除夕); it is also an important opportunity for the Communist Party to communicate official ideology to the people and to showcase the nation’s top performers. Watch the live stream here on What’s on Weibo (if you have no access to YouTube, please check the CCTV live stream here). 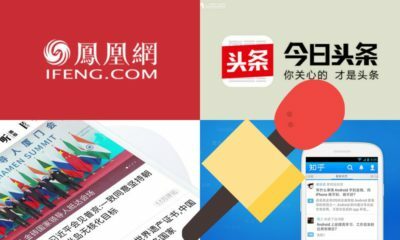 What’s on Weibo provides you with the ins & outs of the 2018 Gala and its social media frenzy, with updates before, during and after the show. Follow our liveblog below (we recommend you keep your browser open – you’ll hear a ‘beep’ when updated). (Note: this live blog is now closed, thank you!). Just 3,5 hours to go before the start of the show, so we have the time to tell you a bit more on the Gala if you’re not so familiar with it. 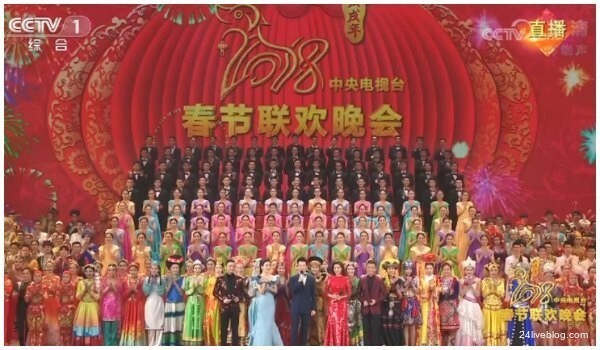 Since its very first airing in 1983, the Spring Festival Gala has captured an audience of millions. In 2010, the live Gala had a viewership of 730 million; in 2014, it had reached a viewership of 900 million, making the show much bigger in terms of viewership than, for example, the Super Bowl. As viewer ratings of the show in the 21st century have skyrocketed, so has the critique on the show – which seems to be growing year-on-year. In 2016, the criticism was so overwhelming that CCTV’s official Weibo account even temporarily shut the comment section on the show. The show lasts a total of 4 hours, and has around 30 different acts, from dance to singing and acrobatics. 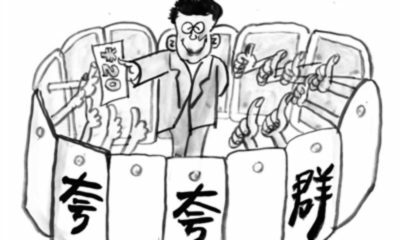 The acts that are both most-loved and most-dreaded are the comic sketches (小品) and crosstalk (相声); they are usually the funniest, but also convey the most political messages. 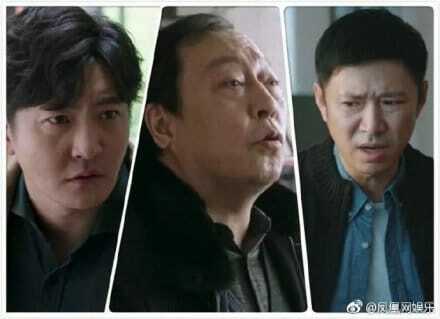 (The controversial 2017 CCTV Spring Gala sketch ‘Long Last Love’ where a woman wants to divorce her husband for not being able to conceive.) 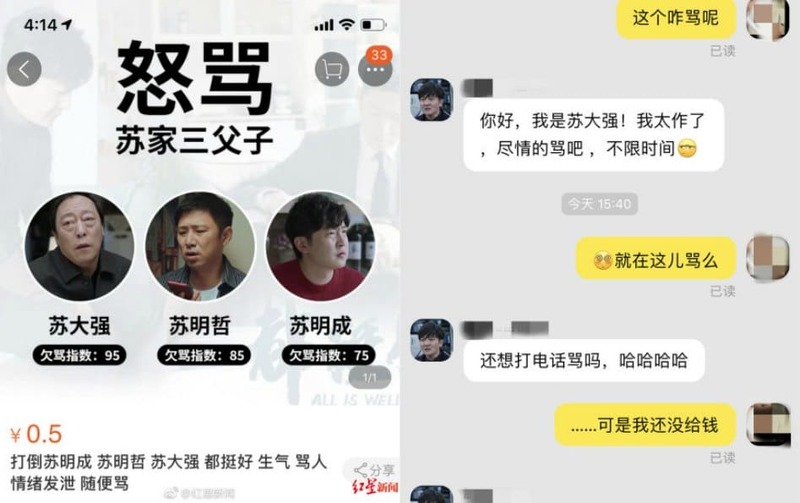 For the general viewers and social media users, mocking the show has become so commonplace that the sentence “There’ll never be a worst, just worse than last year” (“央视春晚，没有最烂，只有更烂”) has become a well-known idiom connected to the Gala. 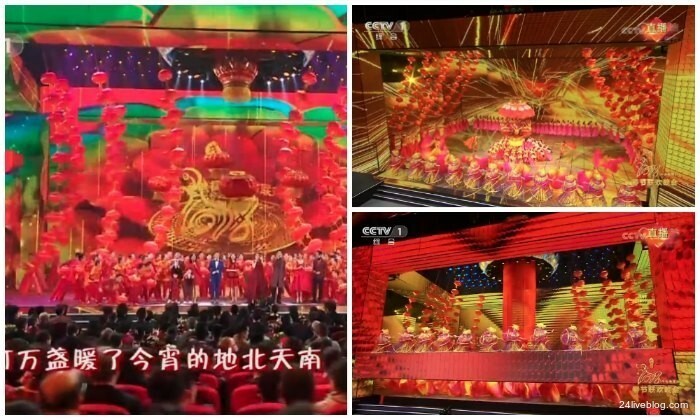 15/02 12:29 What can we expect of the CCTV Gala this year? It’s almost show time! Tonight’s show will feature a total of 42 acts over a time span of 4 hours. Like last year, the show will be broadcasted from various places besides its main venue in Beijing’s CCTV’s No.1 Studio. 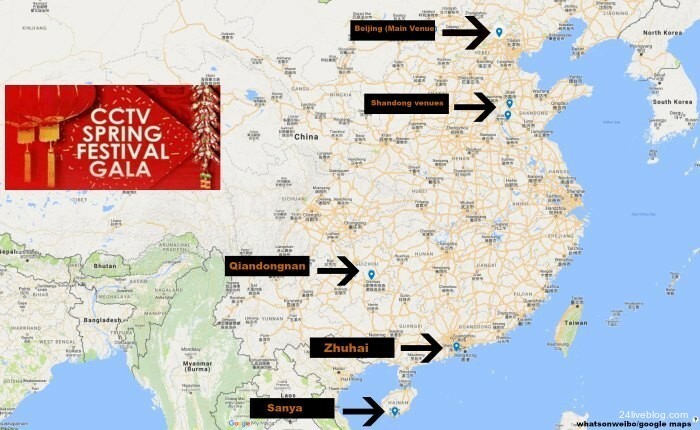 Central to the theme of this year’s Gala is China’s rising power, reflecting on both the Silk Road and the 40 Year Anniversary of Deng Xiaoping’s Reform Policy. What is noteworthy about tonight’s programme is its many Taiwanese performers – a majority of tonight’s big name singers are Taiwanese. Also noteworthy is that although “innovation “ is key to the Gala’s theme tonight, it has many of the same presenters as previous years. 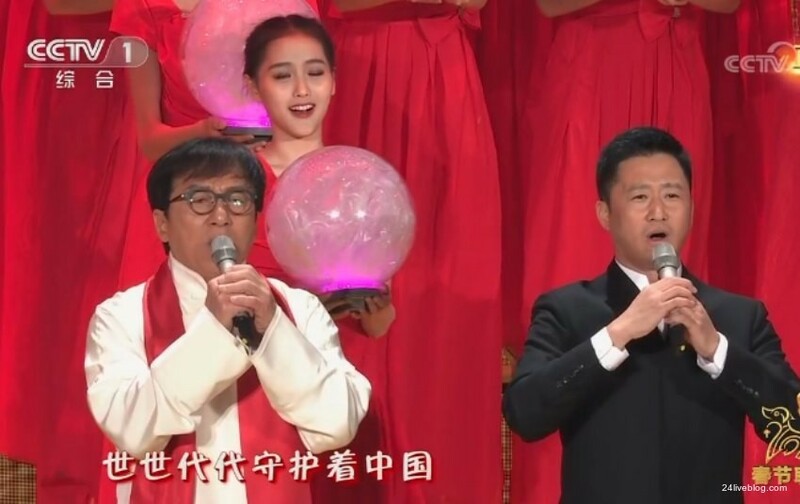 Also, one of the acts that drew a lot of attention last year, namely Jackie Chan performing a song named “Nation”, seems to be repeated in a way: Jackie Chan will perform a song titled “China” tonight.. The song drew critique last year for being too political. 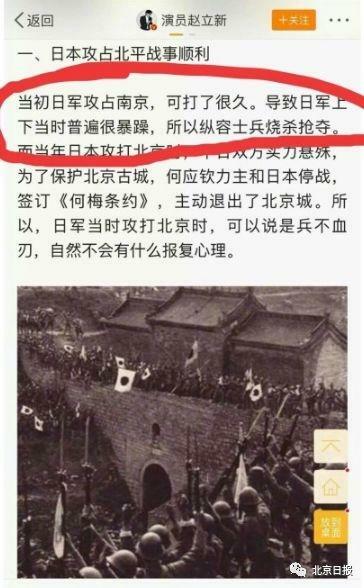 According to many viewers, the spectacle generally is often “way too political” with its display of communist nostalgia, including the performance of different revolutionary songs such as “Without the Communist Party, There is No New China” (没有共产党就没有新中国). 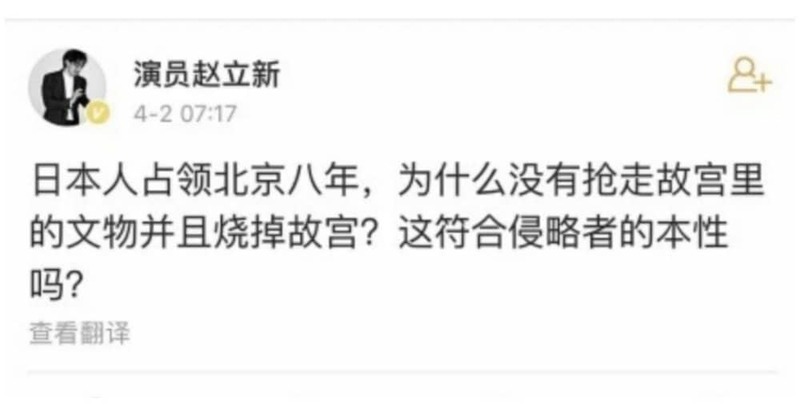 Although there are no titles of tonight’s acts that explicitly mention the Party, we can probably expect the same complaints on Chinese social media. 15/02 12:28 Can You Spot ‘CCTV Gala Brother Smile’ Tonight? 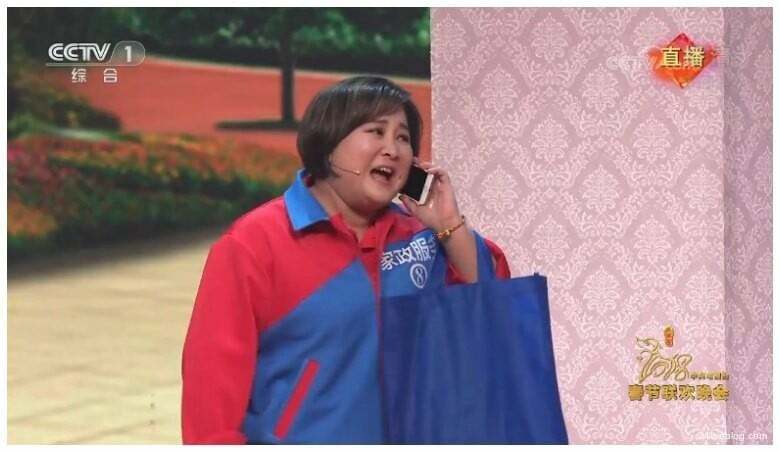 The CCTV Gala is an annual source of memes on Chinese social media. 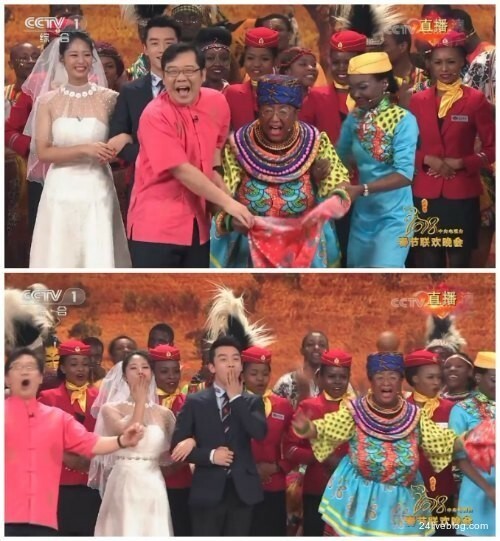 One person who went viral last year is “‘CCTV Gala Brother Smile’ (#春晚笑脸哥#)”. 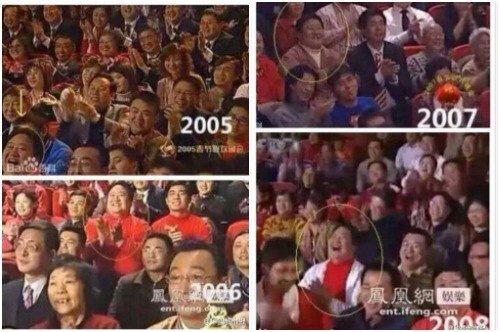 Directly after the ending of the CCTV Gala in 2017, many Weibo netizens discussed one person in the audience – observant viewers have spotted the very same man in the audience of the CCTV Gala every year since 1999. 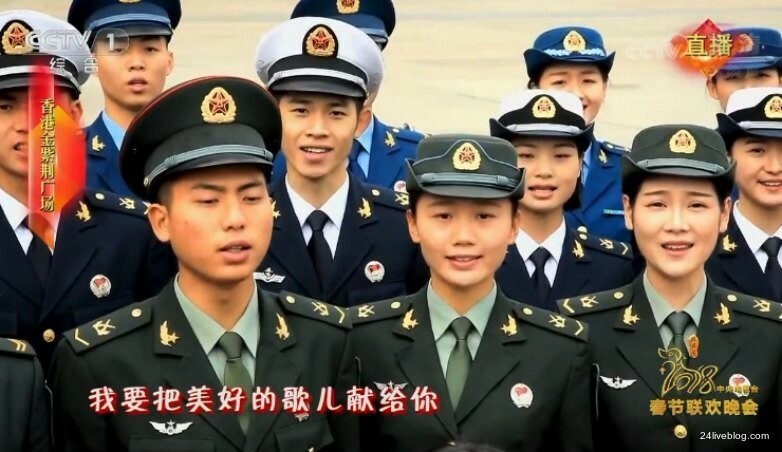 The man was nicknamed ‘CCTV Gala Brother Smile’ (#春晚笑脸哥#) because he always smiles. Many netizens are extremely curious about the man, wondering how he came to sit from the back of the audience to the front crowd throughout the years. Some also compliment him for not having changed much over the past 18 years. 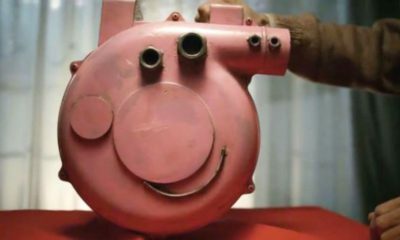 If you spot him tonight, let us know! Like last year, the show will be broadcasted from various places besides its main venue in Beijing’s CCTV’s No.1 Studio, namely from Qiandongnan, an autonomous prefecture in the southeast of Guizhou province, Zhuhai (Guangdong), Qufu (Shandong), Tai’an (Shandong), and Sanya (Hainan). It is a tradition for the Gala to have subvenues where it broadcasts from. 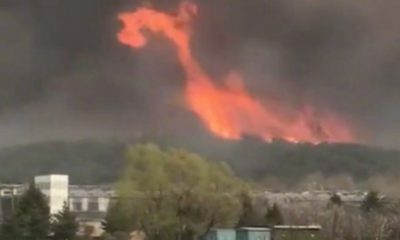 In 2016, the Gala was aired from Quanzhou, Xi’an, Guangzhou and Hulun Buir. 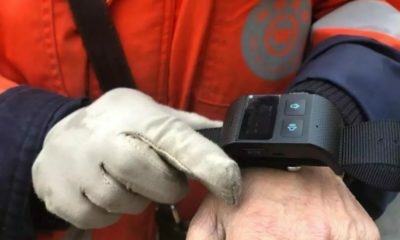 In 2017, it was broadcasted from Harbin, Guilin, Shanghai and Liangshan. Every city has its own hosts, who often welcome the audiences in their own local dialect or language, with performances that are related to the region. 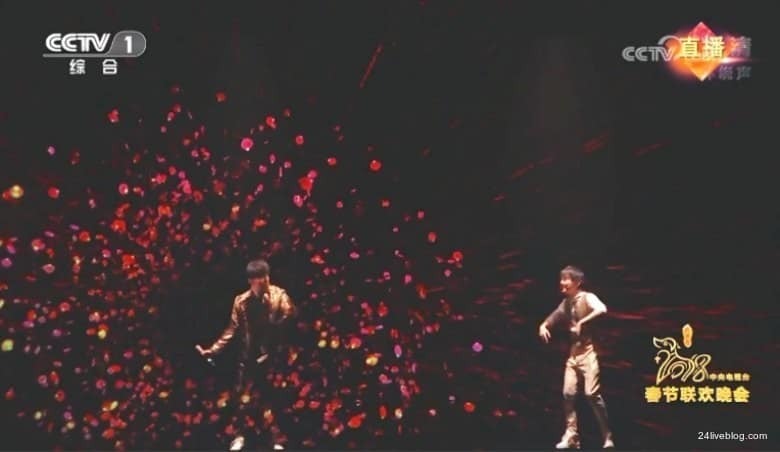 In 2016, the spectacular performance of singer Sun Nan (孙楠) who danced with 540 moving robots, for example, reinforced the image of Guangdong as the home of China’s tech startups. The show has begun! 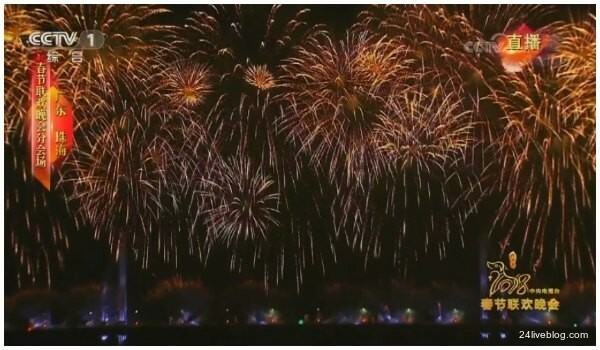 In this opening act, that presents the years of PRC history as “thousands of purples and reds” (“万紫千红中国年”), there are various artists from mainland China, Hong Kong, and Taiwan. From Hong Kong, there is the award-winning singer and actress Joey Jung (容祖儿). From Taiwan, there’s the former F4 pop group member Vic Chou. Other artists in this opening act are Phoenix Legend (凤凰传奇), a Chinese popular music duo of female vocalist Yangwei Linghua and male rapper Zeng Yi, actress and TV anchor Hu Ke with husband actor Sha Yi, and others. The presenters now welcome everyone to the Gala. This year’s presenters of the Gala are Kang Hui (康辉), Zhu Xun (朱迅), Ren Luyu (任鲁豫), Li Sisi (李思思), and Nëghmet Raxman (尼格买). Three of them, namely Kang, Zhu, and Raxman, were also presenters in the 2017 New Year’s Gala. All of the hosts are familiar CCTV faces. Zhu Xun (1973) is a well-known presenter and actress from Suzhou, who is presenting the Gala for a 5th time now. 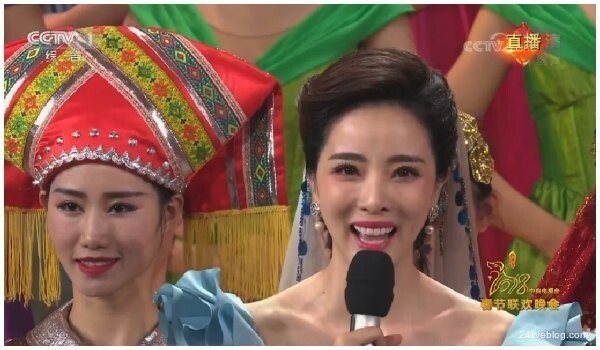 Li Sisi (1986) is the youngest presenter tonight; she is a Chinese television host and media personality most known for her role as host of the Gala since 2012. Kang Hui (1972) is a Hebei-born influential CCTV news anchor. 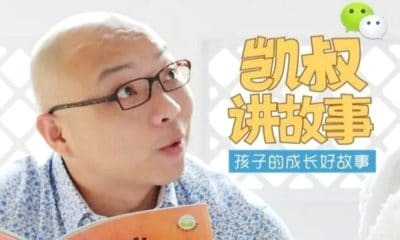 Ren Luyu (1978) is a Chinese television host from Henan, and he has previously presented the Gala in 2010 and 2016. Nëghmet (1983) is a Chinese television host of Uyghur heritage who also is not a newcomer; he hosted the Gala since 2015. 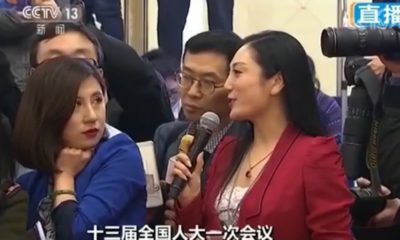 Guizhou: Ma Yue (CCTV) and Dou Aili (Guizhou radio and television host). Guangdong: Yang Fan (CCTV) and Gui Jiachen (Zhuhai TV). 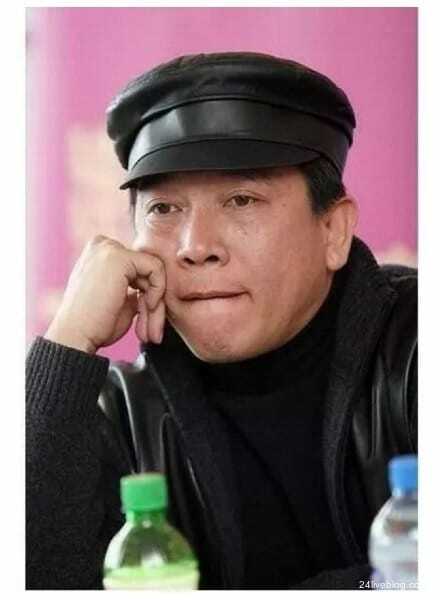 Shandong (Qufu & Tai’an): Li Jiaming (CCTV), Li Yi (Shandong radio and television). Hainan: Zhang Zequn (CCTV), Wang Si (Hainan radio and television host. 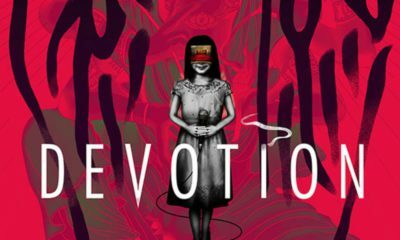 While we are watching the spectacles across the different venues, a little bit about the director and theme of tonight’s show. After themes such as the “Chinese Dream” and “Family Affinity”, this year’s theme revolves around “Chinese values, Chinese power.” One of the most important dimensions of this year is that it commemorates the 40-year-anniversary of China’s Economic Reform Policies (改革开放) initiated by Deng Xiaoping in 1978. This year’s director is Yang Dongsheng (杨东升) from Guangdong (see picture below), who is directing the Gala for the second year in a row. According to Sina News, the word “NEW” is central to this year’s Gala. As we’ve seen in last years, with spectacular Avatar-like settings for dance and singing acts in 2017, and the 540-dancing-robots-act in 2016, the display of ‘innovation’ in entertainment has become an important new characteristic for the Gala. 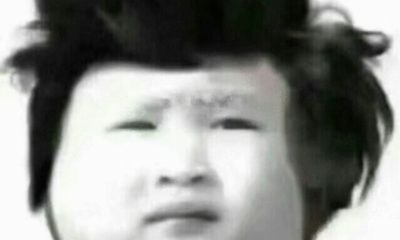 This sketch features a house cleaner who is hired by a young man to pretend to be his mother for a teacher’s family visit, since his own parents work and live abroad. But then it turns out his father is not abroad at all- he pays his son a surprise visit. The boy is not doing well at school in terms of his behavior. A moral of the story is the student are not always to blame; the parents are also responsible. 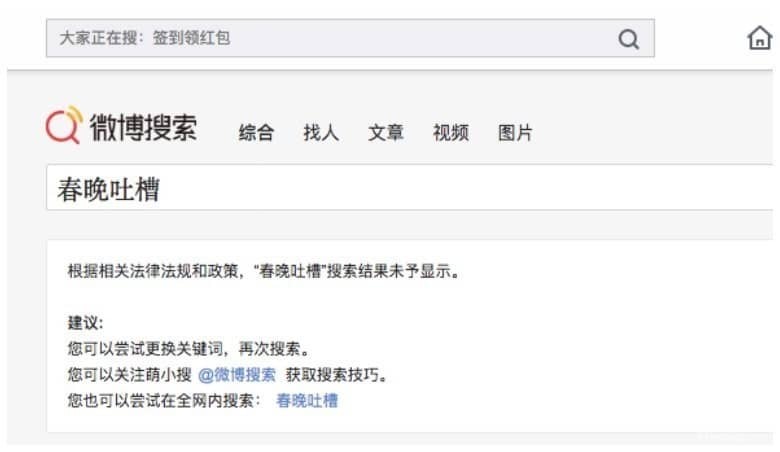 The CCTV Gala has not even reached its first hour, and already the hashtag “Spring Festival Gala Roast” (春晚吐槽) has been censored on Weibo. 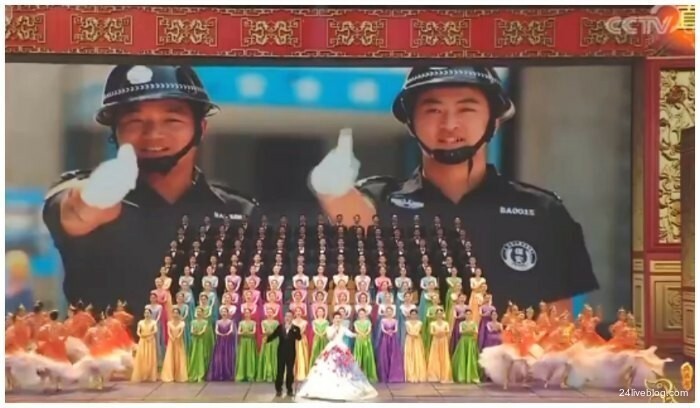 Mocking the CCTV Gala has become a tradition over the years. As aforementioned in this liveblog, “There’ll never be a worst, just worse than last year,” is an idiom that always comes up in relation to the Gala. On Weibo, netizens are not happy that the hashtag used to mock the Gala has been censored. The title of this song is representative of tonight’s theme – CCTV is pushing the “new era” (新时代) as a concept on social media too – they even have a separate section for the hashtag on Weibo. One of the singers here is the popular Chinese singer and actor Li Yifeng (1987), who broke into entertainment after competing in the “2007 My Hero” talent search. He is accompanied by actress Jing Tian (1988) and Maggie Jiang (Jiang Shuying, 1986). Another sketch, of which there will be many tonight. This one features famous actors Cai Ming, Jia Bing and Pan Changjiang. The sketch is about an older couple, whose love and relationship is inspiring a younger driving instructor. The older lady’s husband only has another three months before he turns 70, and they want to learn how to drive a car in order to make a big magical road trip together. It encourages the driving instructor to convey his feelings to his true love. 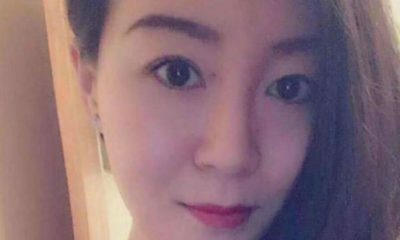 15/02 14:03 Move over to Guizhou! Guizhou’s Qiandongnan is the first subvenue to be featured tonight. This first song, the “Joyous Song” was performed by the Liping County Singing Group, which belongs to the ethnic minority of Dong. The Kam a.k.a. Dong (侗) are a Kam–Sui people of southern China, and they are one of the 56 ethnic groups officially recognized by the People’s Republic of China. They are famous for their carpentry skills, unique architecture, and sweet rice. One of the most-anticipated acts tonight. The song “Love Confession Balloon” is a song by Jay Chou, who is on stage here. Jay Chou is a Taiwanese singer who is also called “Asia’s King of Pop.” He is joined here by Taiwanese-Canadian magician Will Tsai (蔡威泽), who participated in America’s Got Talent in 2017. 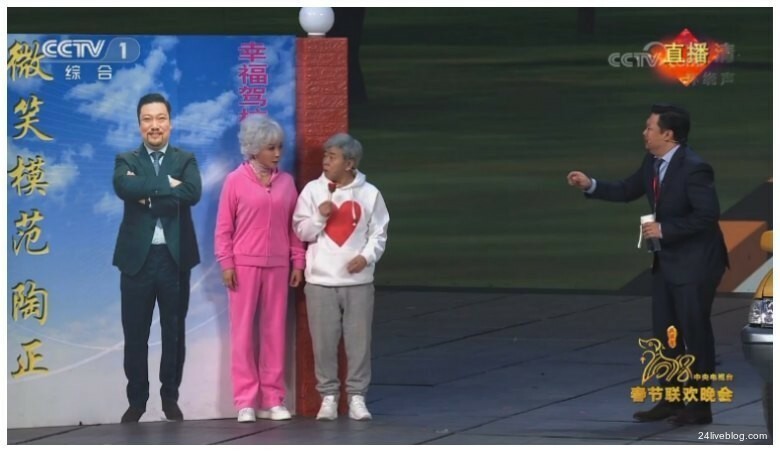 Will Tsai magically makes Jay Chou appear on stage. 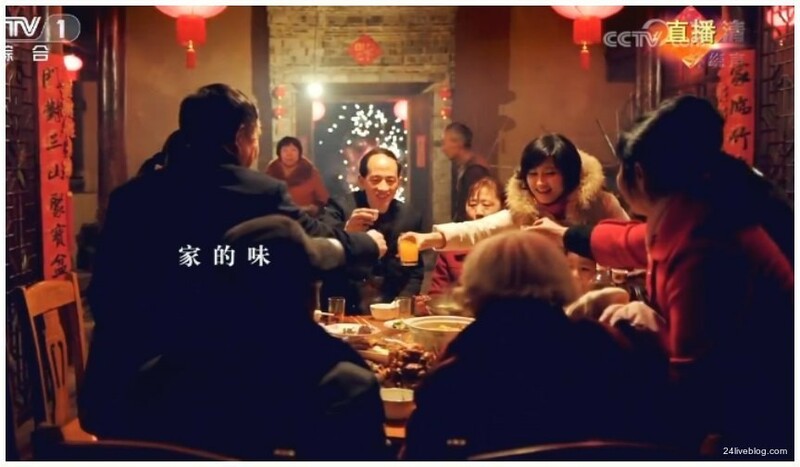 During the CCTV Gala, there will be several two-minute public service ads that reflect on important societal issues and propagate government messages. This is the first one, in which dogs play a central role, since, obviously, the Year of the Dog is about the start in just a few hours. Every year at the Gala, there will be a special performance focused on the kids. 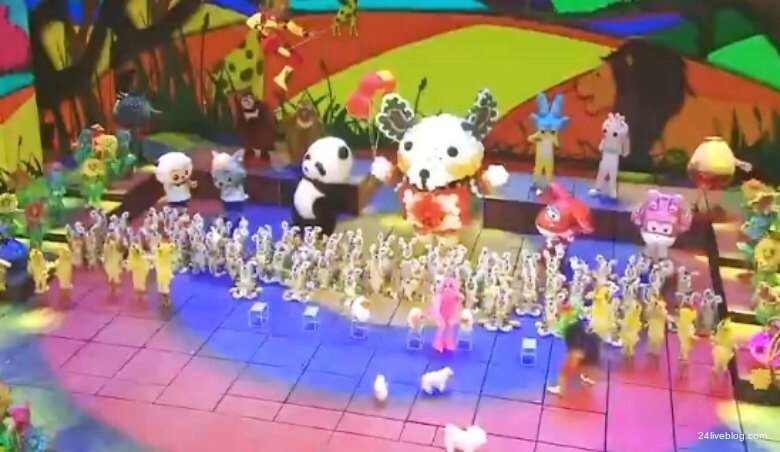 While it was dancing vegetables last year, this year sees dancing panda bears and dogs. 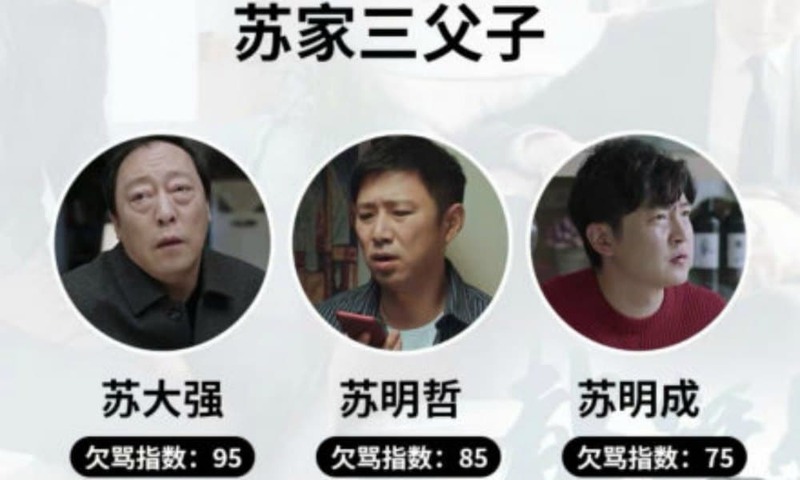 We’ve come to the 11th act of tonight, featuring Taiwanese actors Fang Fang, Zhang Chenguang, Du Zhulin, and also Wang Ji. This item is about coming home for New Year’s, in which we see a familly who bought towels from Taiwan to give to their Shandong family – but the towels are actually made in Shandong. Last year, the Gala drew some criticism for featuring too many northern Chinese dialects. This year is significantly different, as the various acts have already presented various different dialects from across China. The actors in this sketch use a Taiwanese accent/dialect. In general, this year’s show’s focus on Taiwan is really remarkable; not just in terms of singers coming from Taiwan but also the sketches using storylines that include Taiwan. It is especially noteworthy that this sketch’s title is “homecoming” or “returning home”, suggesting the ‘homecoming’ of Taiwan to the mainland. The moral of this sketch is that people from Taiwan have never forgotten their “Chinese roots”, and that Taiwan and mainland China have an unbreakable connection. 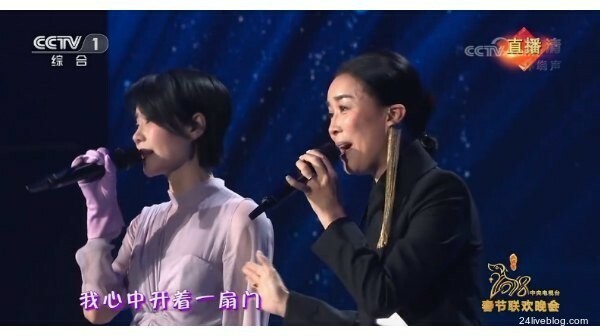 Another act tonight that was a much-anticipated one is this one featuring singer Wang Fei aka Faye Wong and Chinese vocalist Natasha Na (那英). 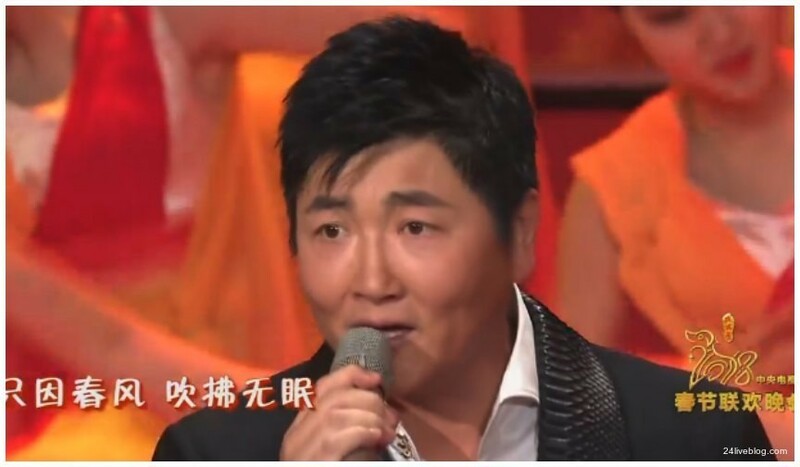 The act is seen as a “reunion” between two of China’s greatest singers after 20 years. In 1998, a cooperation between the two on the very same stage was a great success across China. A special item in today’s program is the “homecoming” of a Chinese painting on the Silk Road – which clearly emphasizes the One Belt One Road theme. On stage are Chinese director Zhang Guoli and the Department Head of Palace Museum Shan Jixiang. The painting is over 30 meters long and has been abroad for a long time. 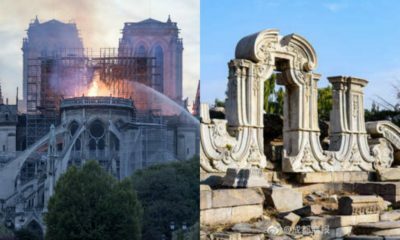 It is now “returning to the motherland” after it has been bought by the billionaire Xu Rongmao – he has donated it to the museum to “protect China’s heritage.” Those who are interested can watch the details of the painting the Palace Museum official website tomorrow. The ensuing dance to this ceremony also focuses on the Silk Road. Depending on where you are live-streaming the Gala from (iQiyi, CCTV website, and YouTube channel all have some slight differences in airing the live event), we have now reached the 15th act of tonight, which is another comical sketch. This year, the Gala is featuring quite a lot of sketches; six in total. 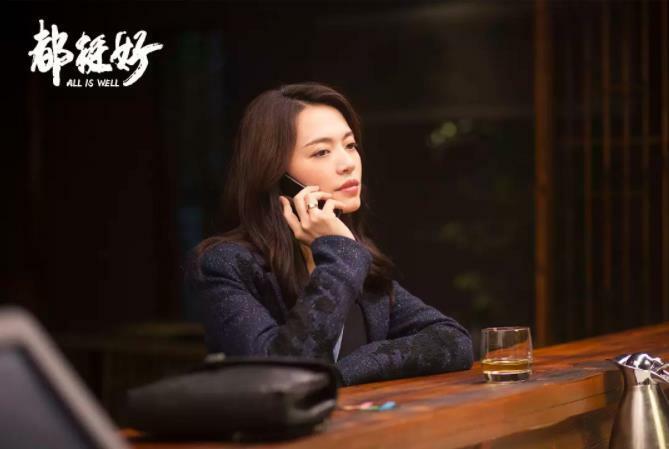 Another genre is the ‘crosstalk’, which we’ll see later in this show. 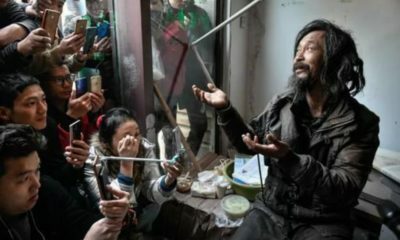 This particular act critiques doing business through “taolu” (套路), Chinese routines to do certain things according to ‘secret’ rules instead of taking the official road; it also suggests that leaders are spending too much time talking and socializing rather than actually doing things. The female protagonist in this act is actually giving the good example, who is all about cutting down on useless meetings, keeping in touch with the common people, and being open to more suggestions. 15/02 15:11 Over to Zhuhai, Guangdong Now! After Guizhou, it is now time to shine for the subvenue in Shandong’s Qufu and Tai’an. 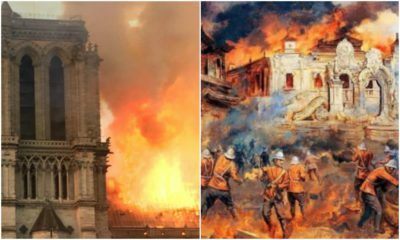 While the song “Courage” is sung, we see some serious acts going on with motorcycles jumping through fire. Really so many Taiwanese singers tonight! 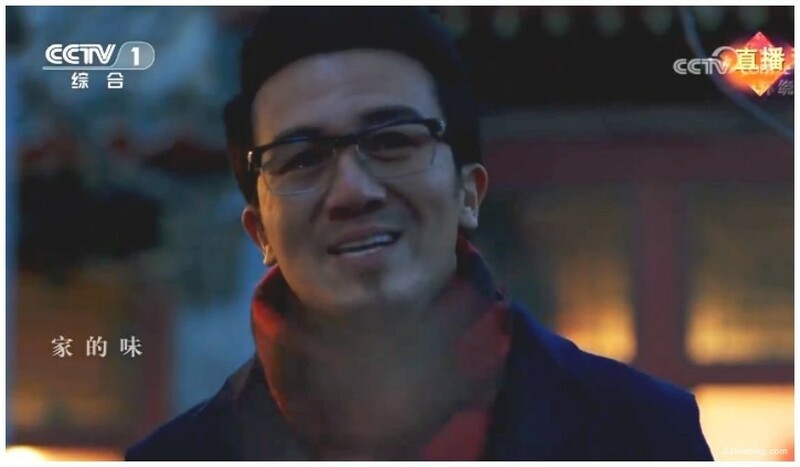 During this act we see Canadian-Taiwanese vocalist Pai Weijun (派伟俊) aka Patrick Brasca, who is a pop singer and songwriter known for singing the theme song “Try” of the film Kung Fu Panda 3. Noteworthy: the children on stage are so-called “left-behind children” (留守儿童) from rural areas who are separated from parents who are working in remote urban areas. Earlier this year, the case of the “Yunnan Ice Boy” increased awareness of the difficult and poor conditions many of these children are in. 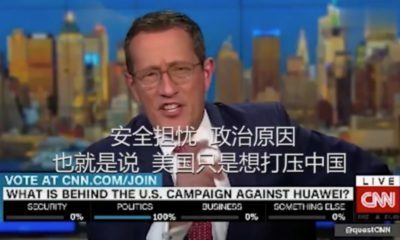 This is the night’s first crosstalk (相声) scene. 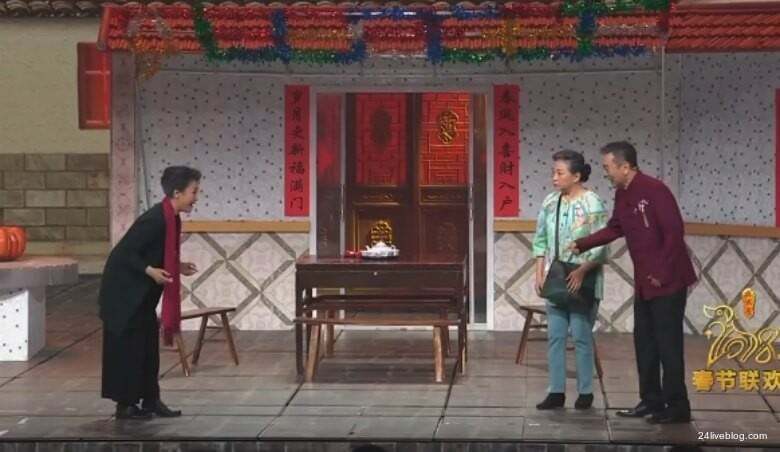 Different from the other sketches (小品), crosstalk usually involves two actors with one being the “joker” and the other being the “teaser”. 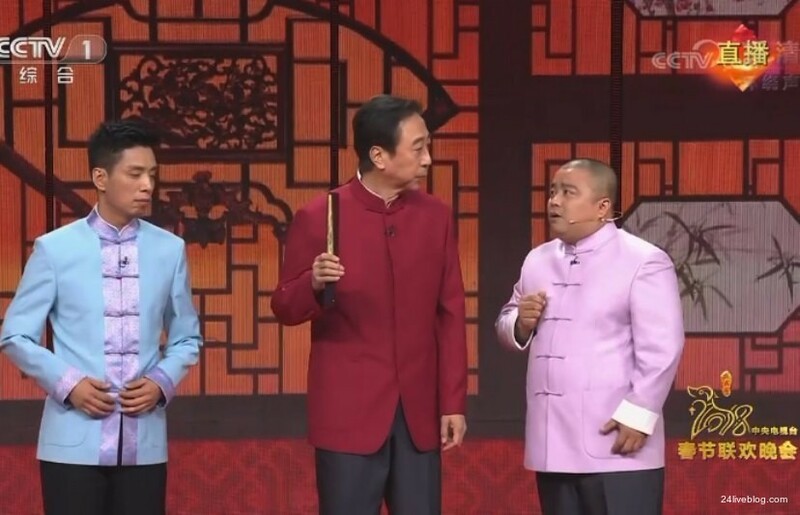 The actor in the middle, Feng Gong (冯巩), is one of China’s most renowned xiangsheng performers. 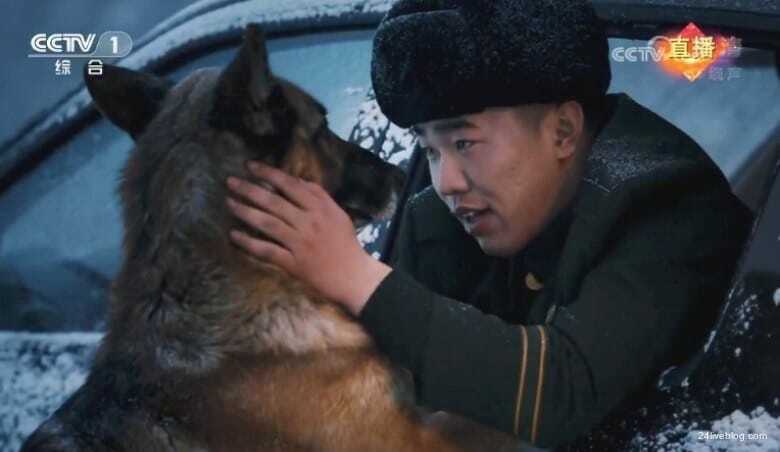 He is best known for his performances in this CCTV New Year’s Gala, and has made more appearances on the show than any other major performer. There are many young vocalists tonight, but Lu Jihong and Zhang Ye are among the more traditional singers tonight. 15/02 15:40 CHINA by Jackie Chan! Here he is again together with Wu Jin! Last year, Jackie Chan’s much-anticipated appearance on the show turned out to be somewhat cringeworthy. 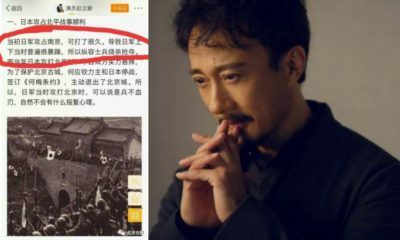 The Hong Kong singer and kung fu star showed his love for China through a song that was simply titled “Nation” (国家). 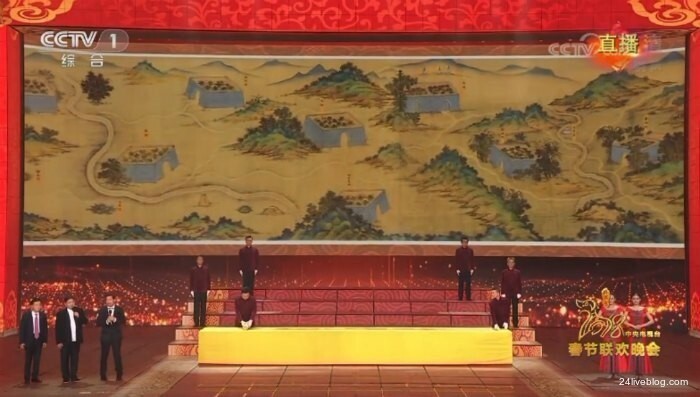 In this act, the Hong Kong celebrity stood in front of an enormous Chinese flag together with students from the mainland, Taiwan, Hong Kong, as well as ethnic minorities. 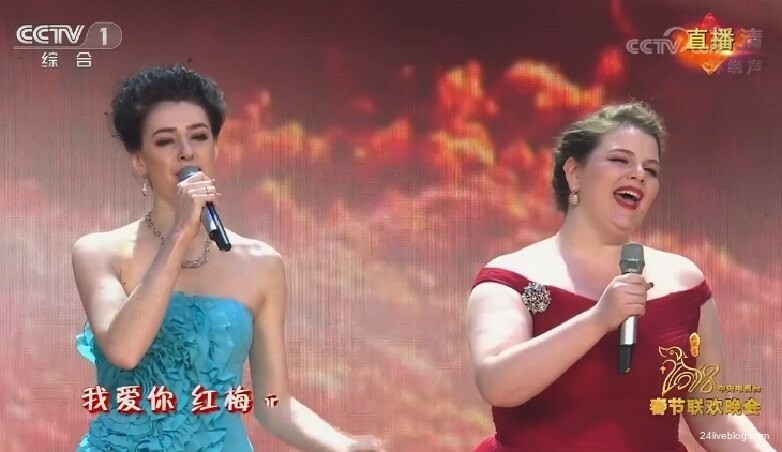 This time, Jackie again sings a somewhat cringeworthy song that is just titled “China” and which praises China and how much the singers love their motherland. 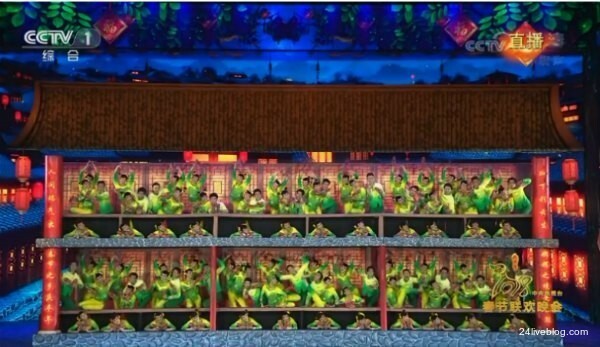 The dancers in the back form the character ‘Zhong” for Zhongguo (China). 15/02 15:35 Is This Show Really Live? After the Gala’s traditional martial arts segment, we now move over to Shandong, where the song “Descendents of the Dragons” (龙的传人) is performed by Huang Xiaoming (黃曉明, 1977) and Hong singer Wallace Chung, Taiwan singer Jerry Yan, and Macao singer Xia Li’ao (夏利奥). This is followed by the piano concert ‘Ode to the Yellow River’ played by the 35-year-old Chinese classical pianist Li Yundi and award-winning Chopin specialist Sa Chen (1979). 15/02 15:54 Piece of Africa? 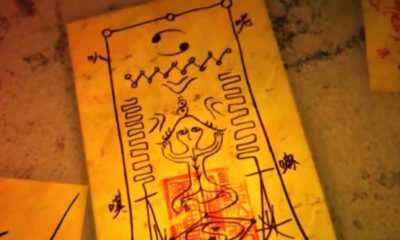 It is a ‘xiaopin’, one of the night’s short sketches, and it takes places in Africa, focusing on the new railway connections (emphasizing the One Belt, One Road intiative). On Twitter and Weibo, however, the sketch is receiving some critique. 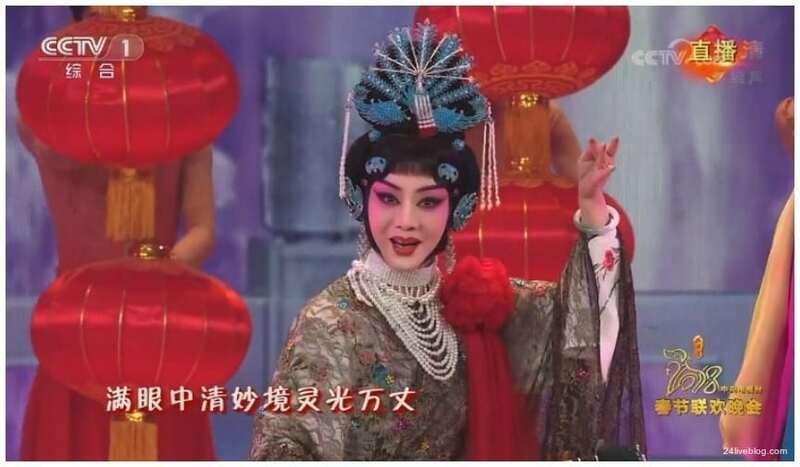 This is the night’s first Chinese opera segment featuring one of China’s leading Peking-Opera artists: Meng Guanglu. 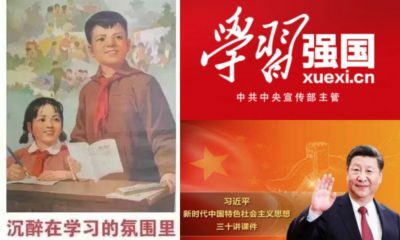 In this song, titled “Rise Again”, China’s Reform and Opening-up policy of 1978 is commemorated. The singer Han Lei is accompanied on stage by a group of young dancers wearing a red scarf. The images in the back display images representing a developing China. Just a bit more than 30 minutes to go before the clock strikes twelve! Meanwhile, tonight’s 4-hour-show seems to proceed with unusual speed, moving from one item to the next within minutes or even seconds. After a (very brief!) moment to honor some of China’s “model workers”, it is time for some acrobatics. 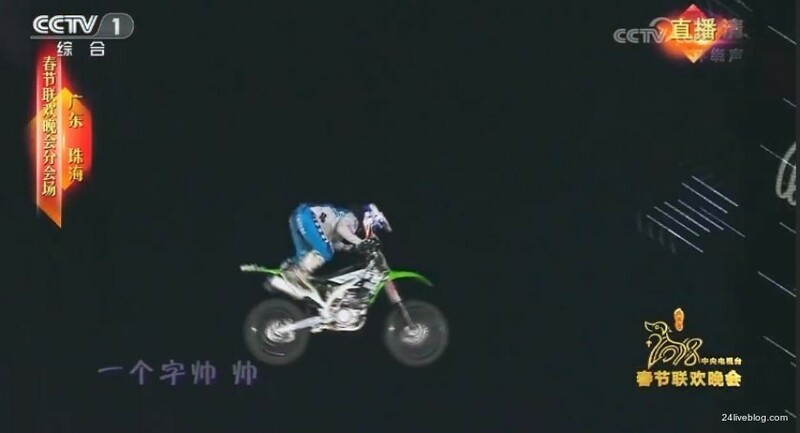 The act “Above the Waves” features the athlete Hu Shi. 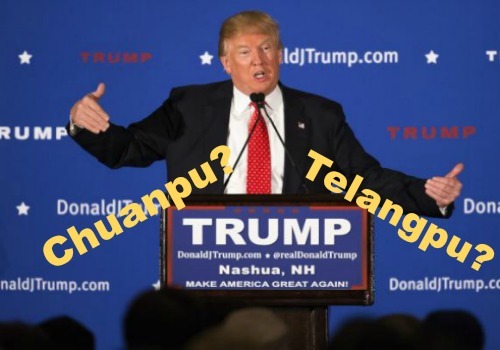 It is time for Sun Nan to hit the stage again. The Chinese mandopop singer stole the show in 2016 when he danced with 540 robotsduring the Gala. This time, no robots, just Tan Weiwei (谭维维) aka Sitar Tan, a famous Chinese singer and actress. 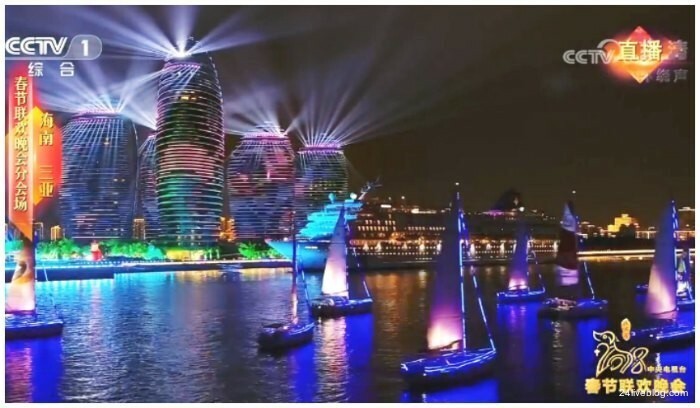 Some spectacular and dreamy scenes from the city of Sanya, in Hainan. 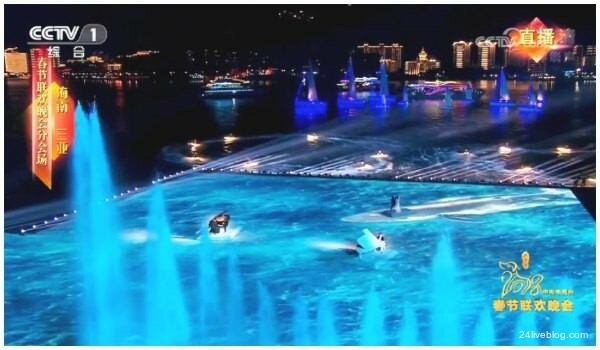 First on piano we hear the song “New Silk Road”, completely in sync with tonight’s themes, played while floating on water. This is followed by the song: “To Brave the Wind and the Billows” (乘风破浪). 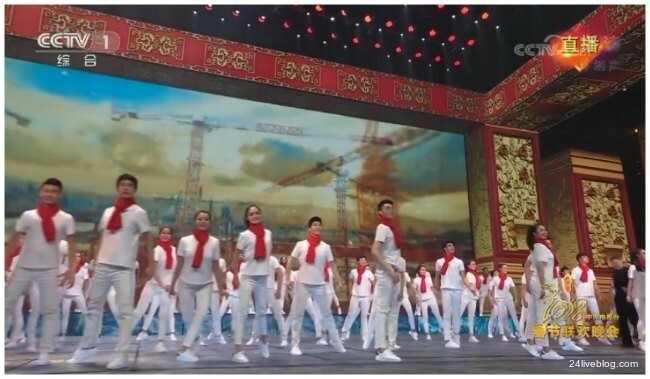 This scene featuring acrobatics and dance with Pan Yuexin (潘跃新) in the lead is quite noteworthy as it has a strong emphasis on China’s military expansion. 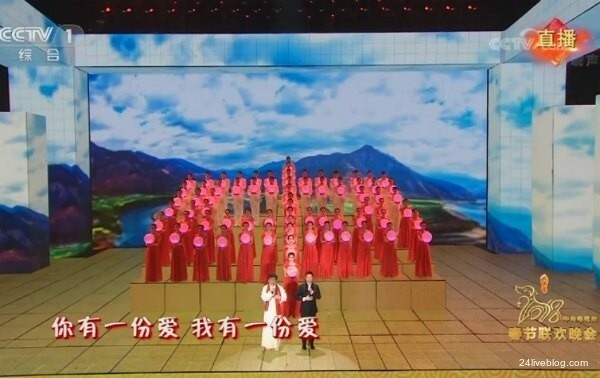 This song, titled “I have a promise/meeting with 2035” is quite representative of tonight’s gala, which is focused on China’s past decades of development and its rise. 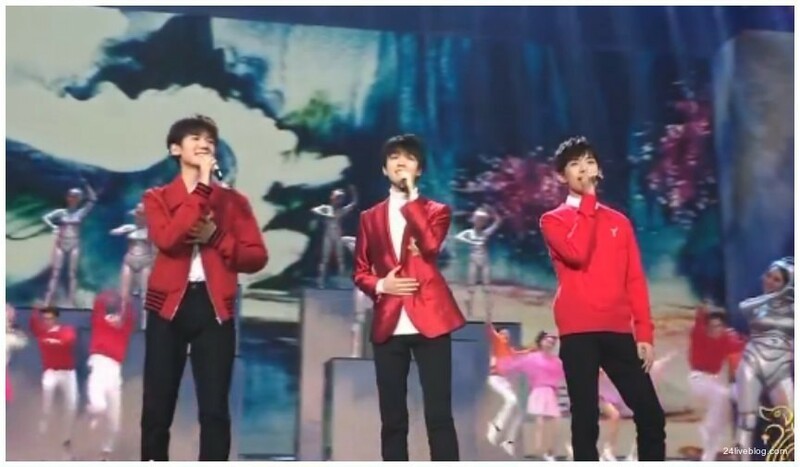 The song is brought by the TFBoys, who have been very successful in China over the past years. 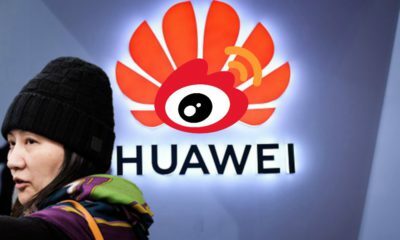 They also appeared at last year’s Gala, and won the Weibo Awards for being the most popular on Chinese social media, for which they received nearly 63 million votes. Their performance here tonight might make it more appealing for younger audiences to watch the New Year’s Gala, which generally has a somewhat stuffy image. 15/02 16:56 A Different Chord Indeed! 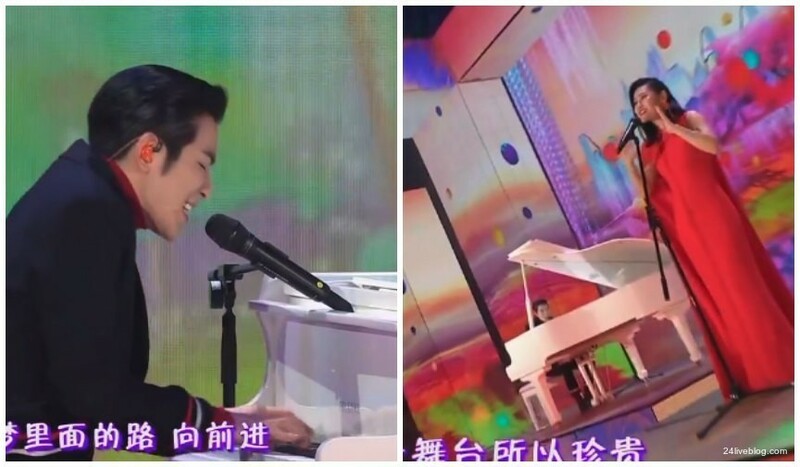 In the last minutes before the new year, the swinging song “Not a Common Chord” is performed by Taiwanese singer Jam Hsiao, and exquisite vocalists Tia Ray and Dimash Kudaibergen. 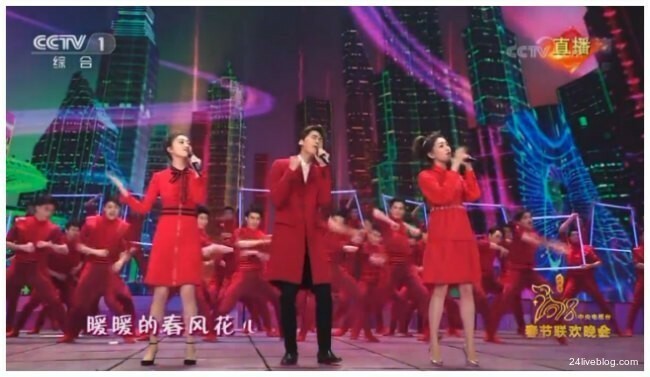 Actually a really funky song and uncommonly cool and danceable for the CCTV Gala. Happy New Year everyone! Just before and after the twelve o’clock moment, there is a clear focus on “China’s New Era”, a theme that is reiterated throughout the Gala tonight – emphasizing that time does not just mark a new year but also a new phase in the modernization of China. 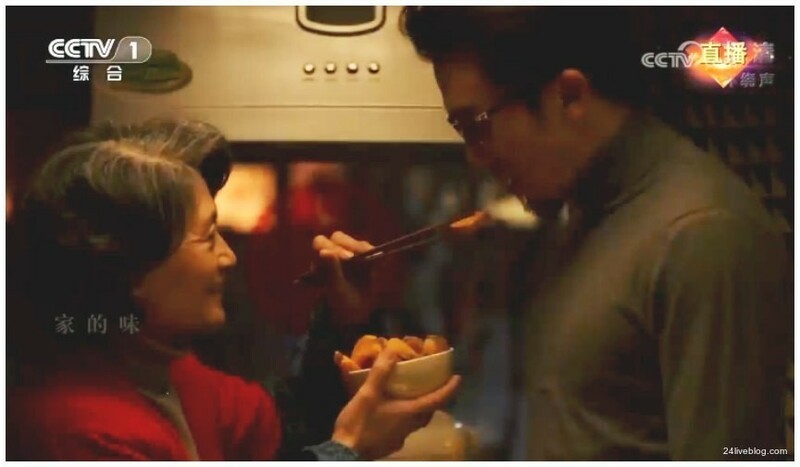 The third – and last – public service ad of tonight was titled “Fragrant Hometown” and focused on people living abroad or away from home and coming back to their hometowns and families, where everything is warm, loving, and fragrant. 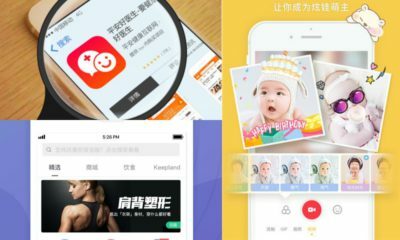 The service ad sends out a message that there is no place like (Chinese) home. 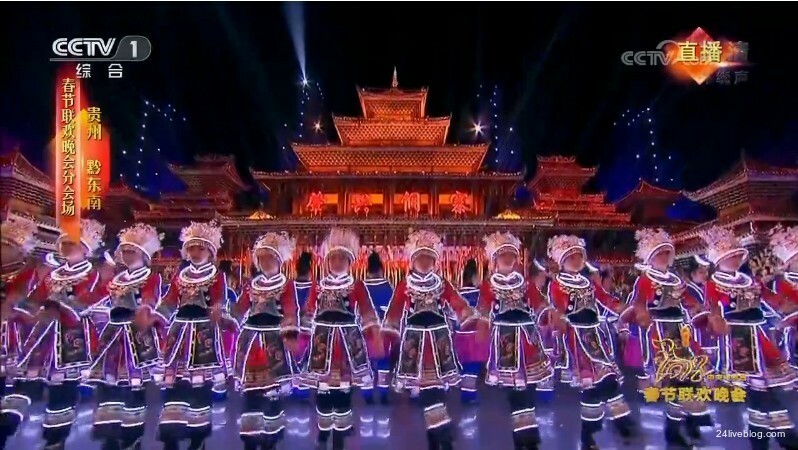 A pretty cool and original dance act in the final minutes of tonight’s show, performed by the dancers of the Langzhong Spring Festival Culture and Folk Art Troupe, Xinghai Conservatory of Music, the Wuhan Art Troupe, and Sichuan University. After the night’s last segment of sketch comedy and dance act, the 42nd performance of tonight, and the last song before the Gala’s traditional closing song, is by main singers Zhang Yingxi and Jin Tingting, accompanied by a group of international (opera) singers from, amongst others, Italy, USA, and Russia. 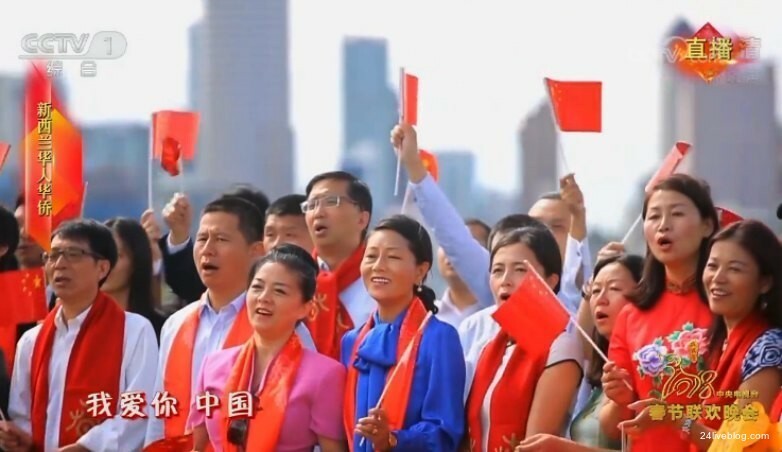 While the song is playing, we see images of people waving the Chinese flag and military staff. The last song of this night is “Unforgettable Night” (难忘今宵). 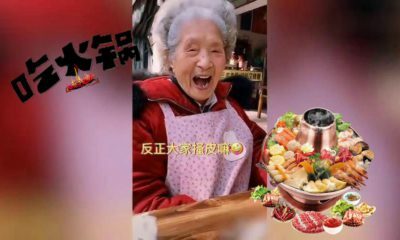 It is sung by the 73-year-old singer and dancer Li Guyi (李谷一) together with Huo Yong, Liu Yuxin, and Tang Fei. Li Guyi sings the same song every year at the end of this show. The last song ends with all performers of the Beijing venue on stage. The hosts wish everyone a happy new year. It’s a wrap! So just asking, why in the song part with Dimash, Tia and Haiso, you only has Tia and Haiso picture but not Dimash. In fact he was the one that stood out on social media, is it fair to only put Tia and Haiso picture on your Blog but not Dimash. I don’t think so that is really how he is used for his talent but you can’t even put his picture.